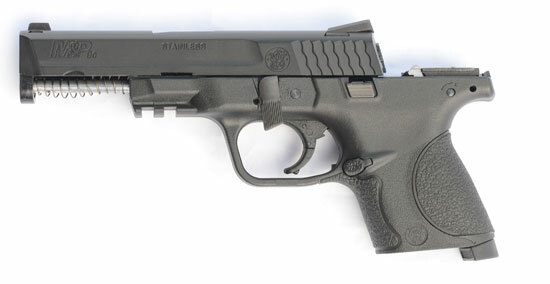 It’s been a while since the first polymer framed pistols came to the real steel markets. While Glock is still hailed as the pioneer of polymer framed pistols, it was actually Heckler & Koch that introdouced the polymer frame to the world of handguns with the VP70, a full 12 years before Gaston Glock introdouced the, by now, his famous pistol, the model 17. 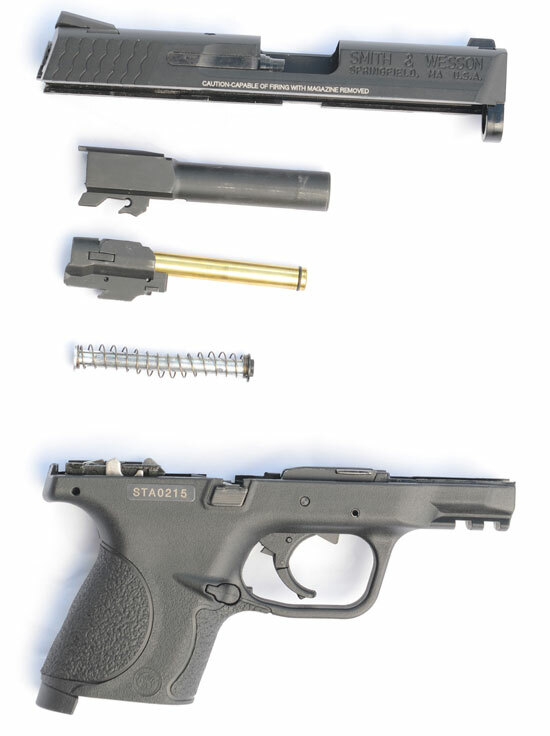 While Glock is the most known, probably the most widely used polymer frame pistol, others have been playing catch-up all these years. And some have managed not only catch Glock but also surpassed the role model in some areas. One of them certainly is Smith & Wesson with their Military & Police line of semi automatic, polymer frame pistols, that range from full size or duty to compact or backup as some like to call them. I prefer to call them conceal carry. 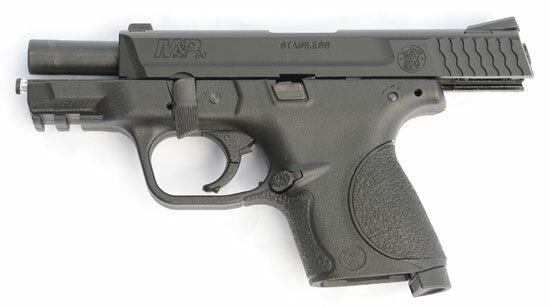 Just so you know, M&P stands for Military & Police, which should clarify for what kind of use it was primarily intended. But these things cought on in dynamic sport shooting such as IPCS & IDPA. 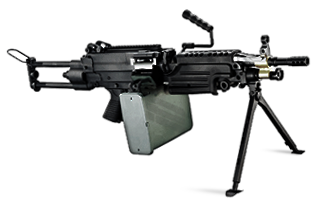 And airsofters being airsofters, we will jump on all kinds of bandwagons, may it be tacticool, movie buff or a geardo, we’ll take it. Ever since airsofters discovered Magpul Dynamics, Costa Ludus and Haley Strategic Partners anything used in those videos, by either Chris Costa, Travis Haley and lately also Kyle Lamb seems to be in high demand. 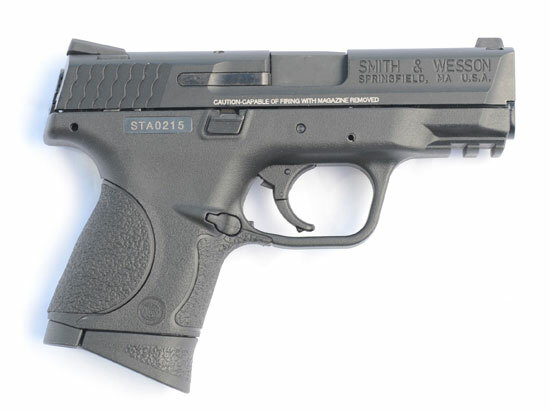 And this includes the Smith & Wesson M&P9, in this case the M&P9C. The airsoft license for Smith & Wesson is held by Cybergun, who markets and distributes all of the Smith & Wesson licensed products. 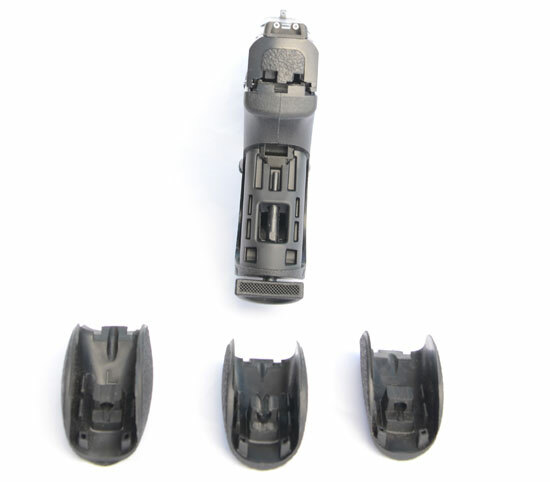 They use reputable manufacturers such as King Arms, VFC and other renowned manufacturers. In this case the manufacturers identity will be witheld, all we can say is, that the GBB replica is manufactured by a renowned Taiwanese manufacturer, that should suffice as we were asked not to reveal the manufacturer. 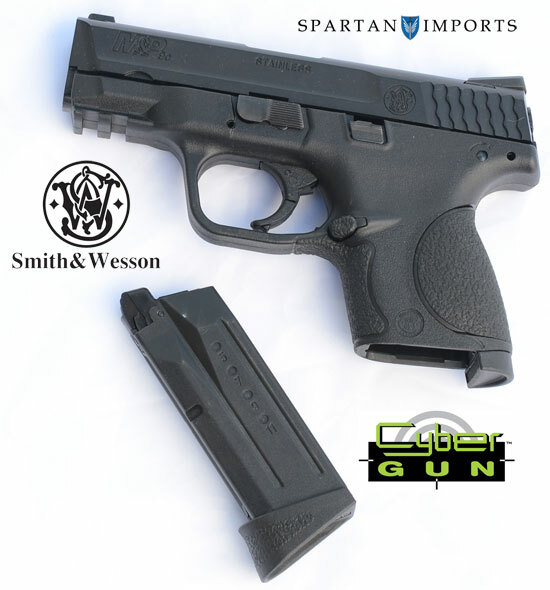 Anyway, we were provided with a test sample of the Smith & Wesson M&P9C by Cyberguns Danish distributor, Spartan Imports. 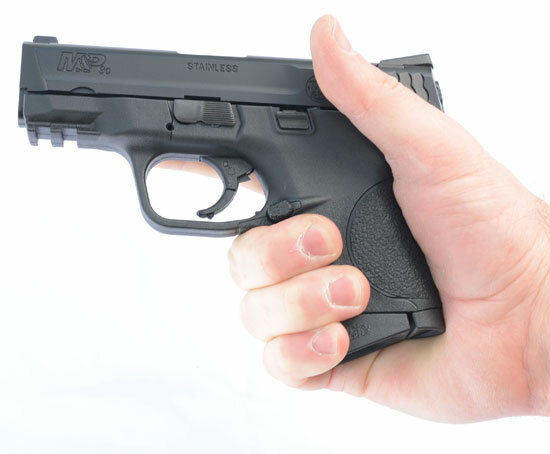 The M&P9C is a fully licensed gas blowback replica. It features a polymer frame, with exchangable backstraps, to fit various had sizes, just like the original. It also features a metal slide with drift adjustable sights with a 3dot system and off course all markings are present and accounted for. 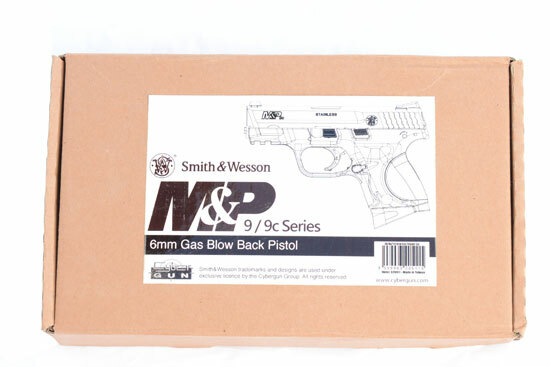 The replica comes packaged in a plain cardboard box, with a nice white sticker on the front, stating we’re dealing with a Cybergun fully licensed Smith & Wesson M&P9C gas blowback pistol. Manufacturer of the replica is not mentioned anywhere. 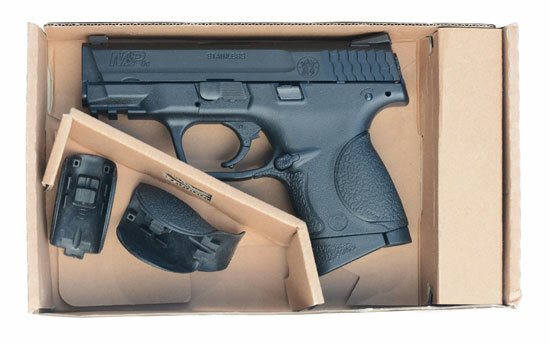 The box includes the pistol, with one magazine, two additional backstraps, serial number plate and dissasembled sight inserts. The replica itself is small and will probably not fit many hands, it certainly does not fit my hand. It is nicely made and resembles the real firearm in every detail. 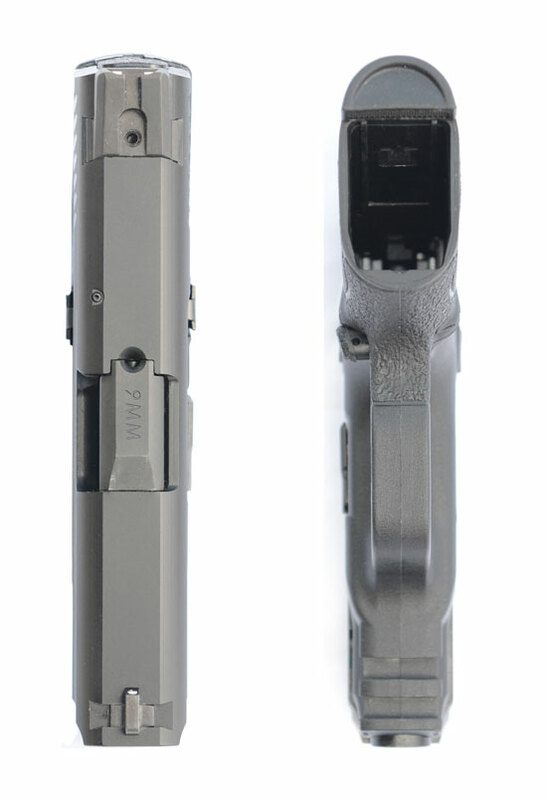 The grip is short, and can only be held properly when the magazine with the factory installed extension is inserted. The size of the grip can easiyl be changed with the replacing of the backstraps. 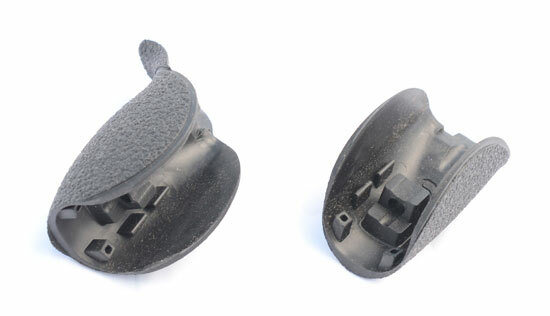 These are made of hard rubber and take some force to install. Once installed they are securely held in place. 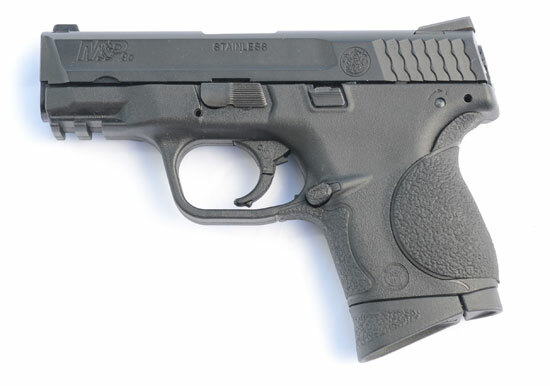 Unlike it’s larger brother, the C version of the M&P9 does not sport a beavertail, this is due to keeping the package small and concealable as the beavertail sticks a bit further back. None the less, the beavertail would make the gripping of the replica more comfortable, but this is no fault of Cybergun as they merely copied the original. 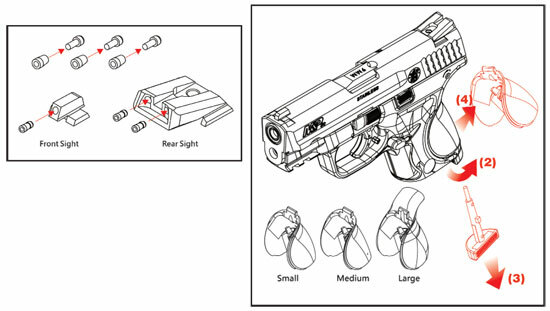 Controls can be found in the regular and expected places, going from the muzzle to the rear, the first one is the takedown lever, followed by the slide stop/release. While the takedown lever can only be found on the left side of the frame, the slide stop/release is fully ambidextrous and can be found on both sides of the frame. the last control on the frame is the magazine release, it’s of the standard push button configuration and is located at the root of the trigger guard. 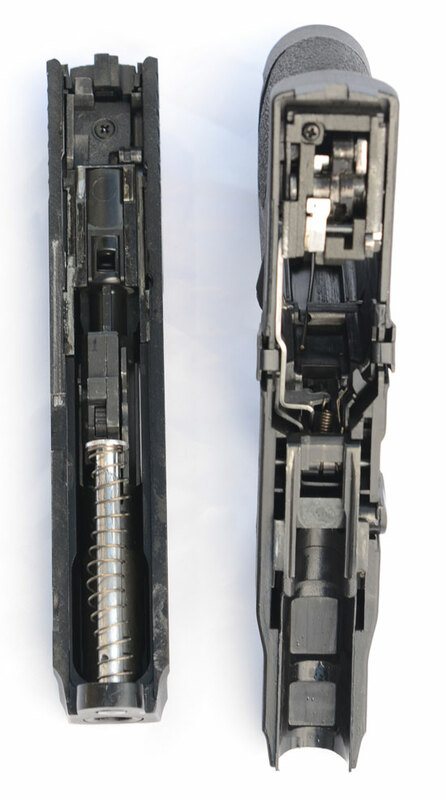 The magazine release is not ambidextrous but can reversed, ie mounted on either side. The right side control on this particullar example was somewhat sticky and did not release the slide upon locking it back every time. The trigger incorporates the safety, which just like in a Glock prevents it to fire unless the trigger is pulled. The trigger istself is very, very good, it’s light, crisp, it breaks very clean. It has a small amout of take-up, with very little creep while the reset is very tactile and positive. Hopefully it will stay that way with prolonged use, I know KSC Glock triggers get even softer and smoother to the point they become a bit too light. The frame is a complete compy of the original except for the small inscription in the inlay just behind the right side slide stop where it says Made in Taiwan, this hints to the manufacturer, but not too flashy as some would expect. The slide and the outer barrel are all metal, made of amuminium. All the details are copied so the cocking serations, markings, fake exttractors and chambered round indicators are present. Sights are inserted into the slide via dovetail cutouts, the rear one is a Novak Low Porfile replica. 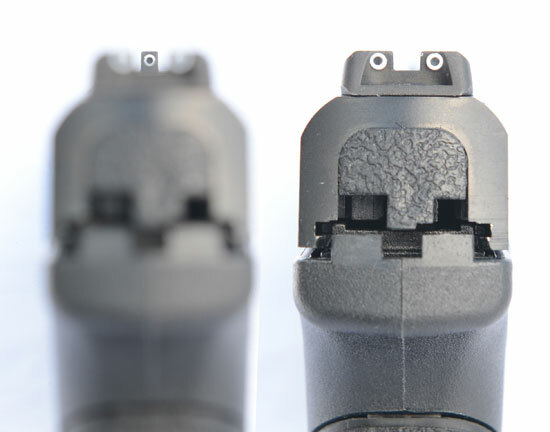 The sights are of a 3dot configuration and come delivered with plastic inserts for the 3dot configuration. One has to install them by himself, but once installed these offer a very clear sight picture. The rear sight is drift adjustable, once a proper setting has been found, it can be secured with an allen screw. We would advise you to secure the allen screw with some blue Loctite, just to make sure you do not lose the screw. 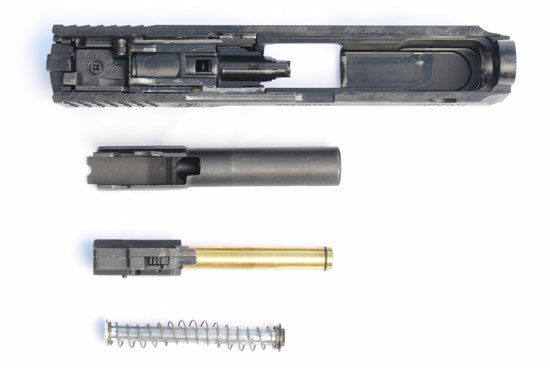 The HopUp is off course adjustable and the adjuster wheel is located on the bottom part of the barrel and cann be accessed only if the replica is field stripped. The unit works flawlessly indeed, adjusting it to maximum, it has no problem handling 0.40g BB’s albeit slowly, but it is consistent at doing so. The short barrel is not to blame for the lask of accuracy. That can be attributed to the short distance between the front and the rear sight, which makes aiming somewhat harder, but for distances bellow 15m it’s plenty accurate to dispatch a torso sized target with ease. At 28 degrees centergrade, using the 0.20g BB’s & Cybergun’s APS gas, the replica shots moderately at 280 FPS at it’s peak. The small volume of magazine means the gas pressure is droping constantly and it usually drops to just bellow 250 FPS with the last BB’s in the magazine. I personally do not hold this against it, as it was never meant to be a real skirmishable replica, but rather backup of a backup. Best shooting performance was achieved with 0.40g BB’s, where accurate fire was constatnly delivered to 35m away, while the BB’s traveled a bit slow, they did hit a torso sized target consistantly. All in all, the compactness, if you are looking for such a feature, is a strong suit of this particullar GBB. The overall performance for such a small package is better than I expected of it. And if your expectations are realistic, you will not be disapointed with this little fellow. Field stripping the replica is done the same way as the real firearm. Remove the magazine, you can check the chamber to see it’s empty, just incase you deal with real firearms and you want to keep this habit, you know, better safe than sorry. Lock the slide to the rear and push the takedown lever 90 degrees down. Grab the slide and either puch the slide release or cycle the slide by hand and push it forward than. There emight be some resistance when pulling it off the rails to the front but this seems to be normal. With the slide removed, you can now remove the captive recoil spring with the recoil spring gude and the metal outer barrel. Further dissasembly is not required for maintenance and cleaning, unless you plan installing aftermarket upgrade parts or simply replacing the worn out ones. The inner barrel is coated with a dark graphite grey finnish and it is a tightbore with a 6.04mm diameter. It’s short as the compact size distates it, but it delivers plenty accuracy. While the inner barreli is a tightbore, anopther issue as far as accuracy goes, can be attributed to this pistol, as it can be to anny GBB pistol is that the barrel moves with each shot, amking it less accurate when compared to any replica with a fixed inner/outer barrel. All in all this is a nice replica, a bit too small for my personal taste and hands. 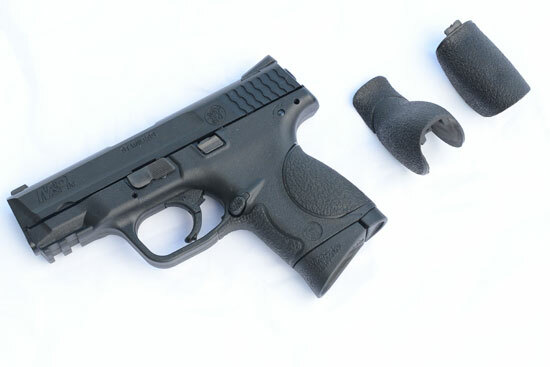 I’m sure there are players who will use it just fine, especially if they have the need for a small, concealable backup replica. 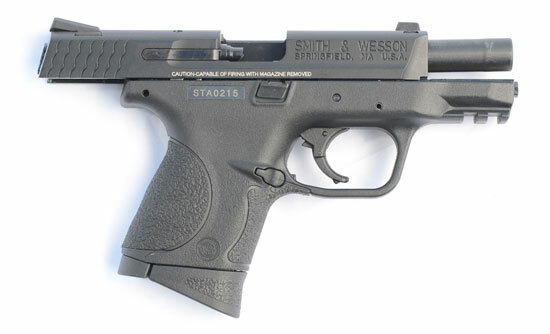 For my personal taste I would have opted for the full size vesrsion, had I been forced to chose among the M&P9 series. I do prefer Glocks, that is no secret. Probably since I’m much more used to them and have been shooting them for years. However, if you are looking for a stylish, small, concealable, reliable and potent replica, the M&P9C should fit the bill more than nicely. The test item was provided by Spartan Imports, special thanks go to Mr. Kim Larsen & Benjamin Hansen.